Please note that pets are not allowed unless the home is marked as a pet-friendly vacation property (assistance animals excepted). 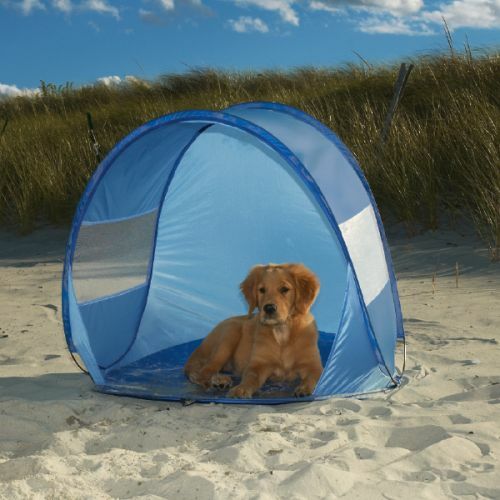 View a list of our Pet Friendly OBX rentals . Pet-friendly properties allow 2 housebroken, well-behaved dogs (or assistance animals). A $140 fee (plus sales tax), is charged for professional flea extermination on all pet-friendly reservations. Pets are not permitted in pools or hot tubs . Please contact us at 1-888-853-7770 with any questions regarding Sun Realty's Pet Policies. Plot rest stops along the way (every 3 hours is a good estimate). 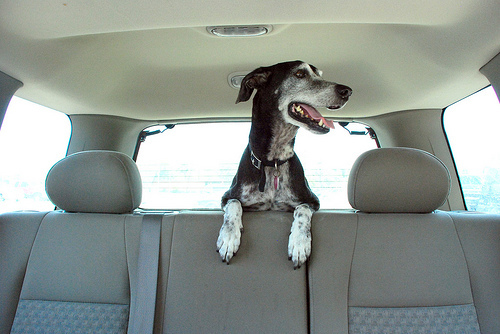 Make a list of several veterinary hospitals that are easily accessible from your route. Hopefully you won’t need them…but just in case. Pack a goodie bag to keep your dog entertained. Include toys, treats, a blanket or dog bed. Don’t forget the essentials: leash, water bowl, medications, medical records and ‘doggie’ bags. Fleas and ticks can be found on the Outer Banks. Don’t forget to apply his/her flea control medication so it has time to take effect. Remember, dogs don’t sweat! This makes them more susceptible to overheating, heat prostration or other conditions with serious side effects. 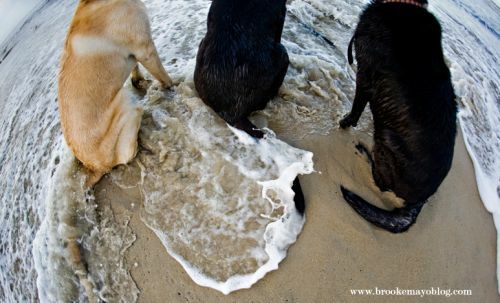 It’s inevitable that your dog will ingest some saltwater while playing on the beach. A small amount of saltwater is OK but ingestion in large amounts can be dangerous to your dog. The most common side effect is diarrhea and vomiting and symptoms usually subside within the same day. If you’re concerned about the amount of saltwater your dog has consumed, contact an Outer Banks veterinarian for advice. Severe dehydration can cause irrevocable damage to his/her internal organs. 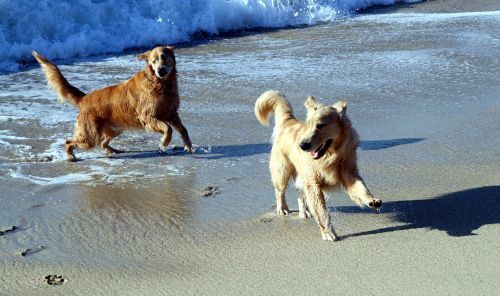 Make sure you keep an ample supply of fresh water available to your pooch while frolicking on the beach! Overheating is a potentially life threatening condition which can be easily avoided. Always have a supply of fresh water available, limit exercise during the hottest part of the day and make sure he/she has a shady place to cool off. The main sign of overheating is erratic breathing patterns. Know the Outer Banks beach report before heading to the beach. Small dogs can actually develop musculoskeletal injuries from the impact of crashing waves or may overwhelm the pooch and cause drowning. Do not allow your family friend to swim too far from land; dogs too are susceptible to the ocean's powerful rip currents. It’s not uncommon for dogs to suffer from minor injuries or illnesses while playing on the beach. Most common injuries/illnesses such as hot spots, diarrhea, foot injuries and lacerations can be treated at home, but if you’re ever in doubt always consult with one of our Outer Banks vets. Hot Spots are typically characterized by itchiness, redness, area sensitivity, hair loss (due to chewing and licking), and sometimes oozing. They often occur on the hind area or on the face. Caring for hot spots: carefully trim the hair over and around the area, clean area with soap and water or hydrogen peroxide. Apply an over the counter cortisone cream 2x a day. If condition worsens, contact one of our OBX veterinarians for professional advice. Diarrhea can often occur when your pooch ingests too much saltwater, changes in his dog food, the stress of traveling and being in a new place. If diarrhea is accompanied by vomiting, forgo any home care and contact an OBX veterinarian right away. Over-exertion, whether while running on the beach or jumping up and down stairs, can often lead to foot, hip or leg injuries. Rest is usually the answer for this one, however, if sensitivity continues, contact an OBX vet. Minor abrasions or cuts should be cleaned with soap and water and then coated with a triple antibiotic 2x per day. If redness or bleeding continue or become worse, contact an Outer Banks veterinarian. The information above was compiled from several different veterinary sites for your convenience. In no way does Sun Realty claim to be an expert on dog safety or health concerns. If you have a concern about the health and safety of your pet, please contact your veterinarian or one of our trusted Outer Banks veterinarians. Search our wide selection of Pet Friendly Outer Banks vacation rentals !